In Melbourne, food is a fashion. From macarons to cupcakes, salted caramel to cookie dough, chai to turmeric, beetroot and fetta to poke bowls; we eat and serve it while it’s hot, then drop it when it’s not. But every now and then, there is a boutique, that is slightly out of fashion, boasting its own style. 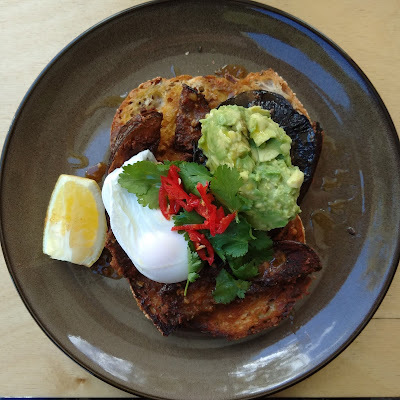 Golden Child is half way in the mainstream (with favourites like corn fritters and smashed avo), and partly its own style (with creative combinations like caramelised eggplant on toast, and fried brussel sprouts). Coffee is good. Strong but smooth. The eggs are well poached, firm whites, runny yolks. Vegetarian options include eggs on toast; polenta chips with mushrooms, avocado and a poached egg; a variety of salad style dishes; and, my favourite, the caramelised miso eggplant. The eggplant is strongly flavoured, but not sweet, with the miso added generously then grilled. Adding to the intensity of flavours are roasted mushrooms and chilli. A smash of avocado, and a base of multigrain toast brings it altogether. And how is the atmosphere? Relaxed. This is your casual local café. The one where you become a regular and glad that good food is so close.